Monday June 28th 1909 The men come to paint again today I was busy with the regular work all forenoon. At two oclock I went down to [Stilknells?] and selected paper for all the rooms needed I was well satisfied. Will went to town for the paint for the outside of the house and Mr Munifield began work. Tuesday June 29th 1909 The men finished the inside work today. I was busy with the regular work and cleaned the floor in our room and put things to rights. Will cleaned the old carpets and I ripped some of them ready to work. Weather very warm. We put in some time this afternoon deciding on the color of the house. It will be cream with brown trimmings. 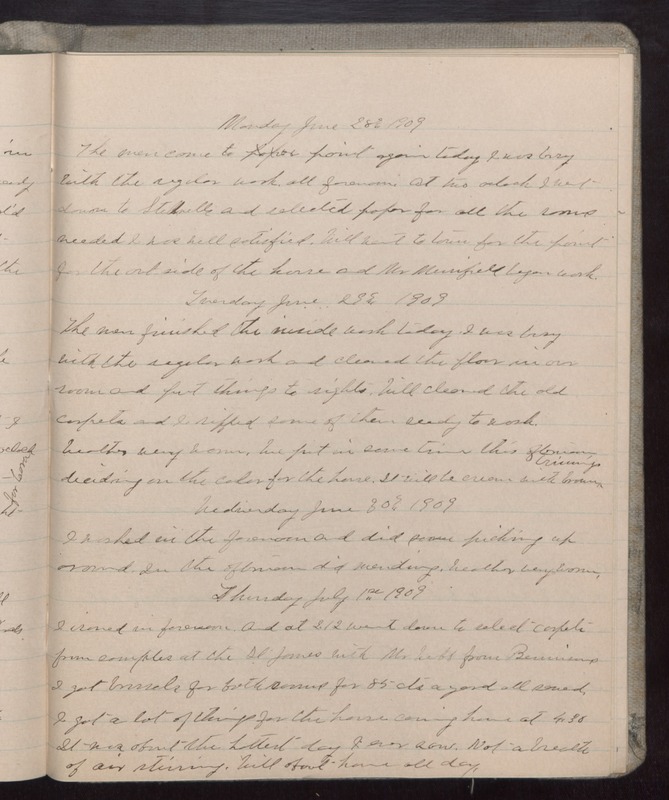 Wednesday June 30th 1909 I washed in the forenoon and did some picking up around. In the afternoon did mending. Weather very warm. Thursday July 1st 1909 I ironed in forenoon. And at 2.12 went down to select carpets from samples at the St James with Mr Webb from [Bennisens?] I got [brussels?] for both rooms for 85 cts a yard all sewed. I got a lot of things for house coming home at 4.30 It was about the hottest day I ever saw. Not a breath of air stirring. Will about home all day.